This post is brought to you by Boston Market. All opinions are our own. Is anyone else totally overwhelmed by their massive back-to-school to-do list? Between shopping for new wardrobes (why do kids have to grow SO fast? ), tackling massive supply lists and trying to get everyone back into some sort of routine, I feel like I don’t have time left in the day to breathe, let alone cook a huge dinner. Thankfully, I found the perfect solution to the dinner problem: Boston Market! 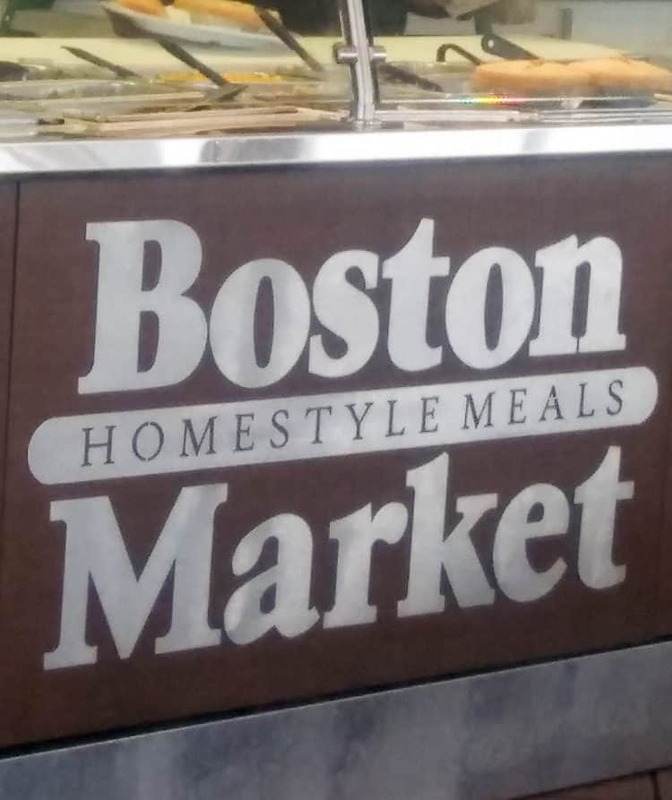 Boston Market doesn’t just make it easy for me get a delicious family-style meal on the table fast, but they have an amazing deal going on to help me check off another back-to-school list item: lunches! What other delicious ways can you think of to use your $1.99 whole rotisserie chicken from Boston Market? Share below! I made a trip to Boston Market this week with some of my favorite people and picked up a Family Meal. They come in sizes to feed 3, 4, or more people. 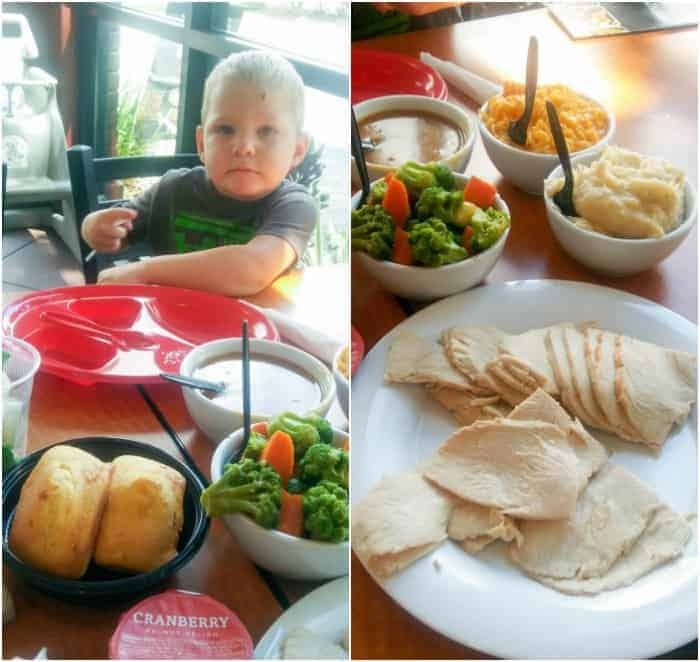 You can choose from rotisserie chicken, meatloaf, BBQ Ribs, or roasted turkey, and then you get your choice of sides and, of course, Boston Market’s amazing cornbread. 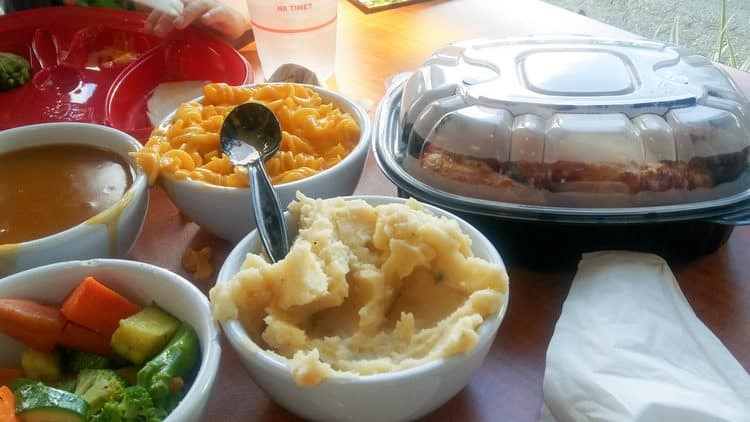 We had delicious creamy macaroni and cheese, veggies, and mashed potatoes with gravy as our sides. While there, we also took advantage of the fabulous special Boston Market is running. When you purchase any family meal you get a fresh, never frozen rotisserie chicken for just $1.99. If you have a huge crew to feed, the deal is great because it really stretches out their already generous family-sized meals. 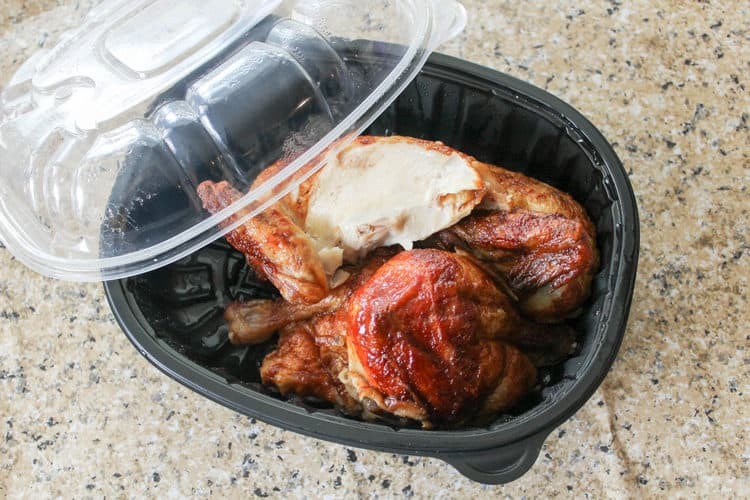 If you don’t have a huge family and really want to make the most of it, though, do what I did and take your $1.99 rotisserie chicken home to use throughout the week in lunches. I wanted to share with you the three ways I used our leftover rotisserie chicken this week to make lunchboxes easy, healthy, and tasty! Check them out, then keep reading for a few more delicious ways you can use up that rotisserie chicken throughout the week! 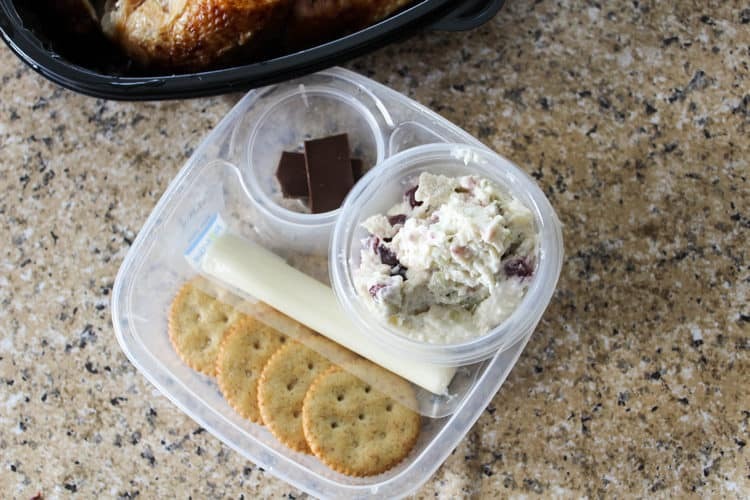 1- Chicken Salad- Make up your favorite chicken salad recipe (we like mayo, pecans, dried cranberries, and diced celery), add crackers, a cheese stick, and a little treat like a few pieces of a chocolate bar. 2- Chicken & Broccoli- Cut small slices of chicken, pop in some fresh broccoli, and ranch dip- dip is a surefire way to get kids to eat whatever you have packed. 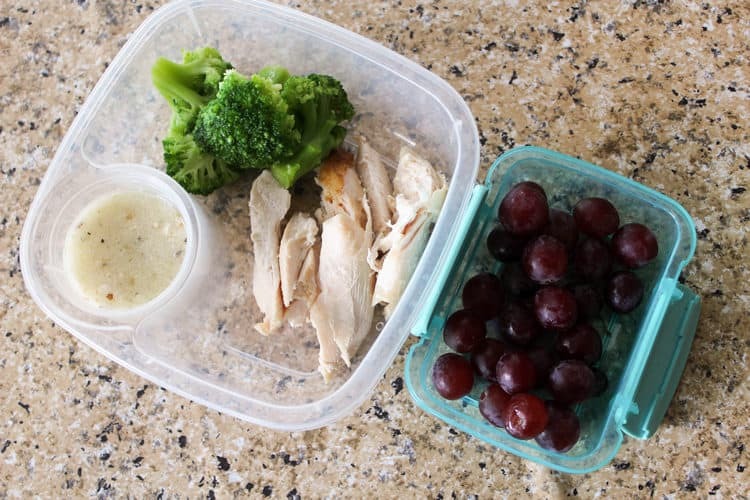 Don’t forget some fresh fruit like grapes in your lunchbox to round it out. 3- Chicken & Cheese Quesadillas- Shred or chop your chicken, add chicken and shredded cheese to a tortilla, brown on both sides. Allow to cool then pack in your lunch container, add a dip like sour cream and salsa. Toss in some fresh heirloom baby carrots and you have a lip smacking lunch! Back to school season is probably never going to stop being overwhelming, so we have to take advantage of any shortcuts we can find! Thanks to Boston Market’s delicious home style meals and their amazing $1.99 whole rotisserie chicken deal, you can check off two things from your to-do list in one quick stop: a delicious dinner AND yummy lunches for the first few days of the school year! Visit Boston Market online to learn more and to find a location near you. Follow Boston Market on Facebook and Twitter to keep up with news and other great deals throughout the year! Celebrate Thanksgiving Early with 15% Off Blurb Photo Books! I am a Florida girl through and through living the semi-country, small town life. I am making my way through it with my amazing hubby, 2 beautiful kids, 2 of the best Dachshunds to ever walk the face of the earth, massive amounts of coffee and a whole lot of Jesus. I write, craft, cook, scrapbook, garden, raid the thrift shops, snap 1,000’s of photos, and read when I can grab a spare minute (which is rare). I love those ideas–really simple and easy but also nutritious! Boston Market has awesome rotisserie chickens too! These are such great ideas! Their chicken is amazing, and I love to be able to make multiple meals out of one dish. We will have to try these out for our lunches. I am so glad I found this article, it is very useful! And that food looks delicious. Thank you for sharing. This is a smart idea!! I will have to remember this soon. Only a few more days left. Too sad that summer is ending and lunches are necessary again so soon! Thanks to this my kid will have more differents variety of lunches! With which should I start?? Great ideas for packing school lunches. Always at a loss for thing about something new and innovative to pack for lunch. Yum, now you have me thinking about Boston Market, which then makes me think about yummy mashed potatoes. Hubby enjoys their rotisserie chicken and $1.99 is a nice deal. I wish there was a Boston Market near me. I love their food, we used to eat there a lot when my husband was working in Atlanta. Great deal on their rotisserie chicken. Rotisserie chicken saves me sooooo much time for dinners. I’m not sure why I never used it for lunches but I totally will! Ah, these are amazing lunch ideas! It seems like it would be easy to make a week of school lunches with one rotisserie chicken. That is a great deal on a rotisserie chicken. And I love the idea of using it in lunches for the week. I can’t buy a whole chicken for that price! Rotisserie chicken is such a timesaver. I’m sure my kids would love chicken roll-ups with cheese. lettuce and salsa or grilled chicken wraps. I love roasted chicken and how versatile it can be. I have to say, I am about ready to run out and get some just so I can make the quesadillas. One of my favorites! We usually make our own roasted chicken, I actually do two at a time so making these lunches would be wonderful and easy. In a pinch picking one up would work. Great suggestions! 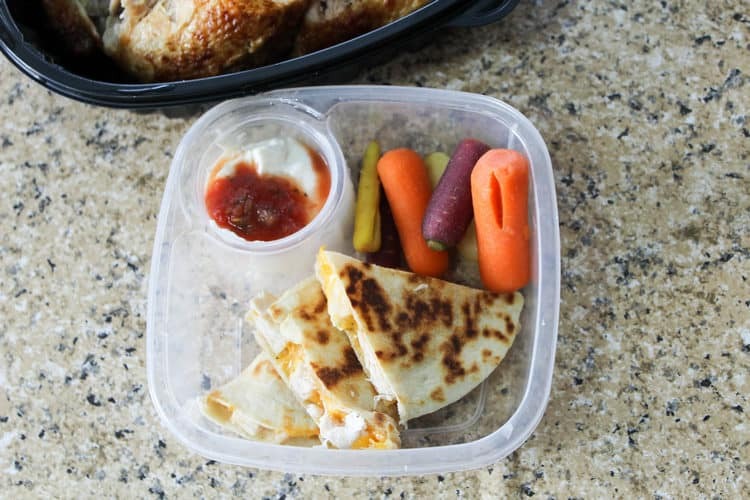 I especially love the Chicken & Cheese Quesadillas – so easy to make and my kids love them! Yum, thank you! I just love rotisserie chicken. We normally just eat it as is, but I’ll keep these ideas in mind too. I wish we had a Boston Market nearby. I use rotisserie chicken in so many chicken recipes. It’s a quick and easy way to get dinner on the table quickly. All of the lunches you created look delicious. I love Boston Market. I will be honest a lot of school lunches are absolutely gross. This is such a great alternative of suggestions to pack for the kids. Yum! The Chicken & Cheese Quesadillas look amazing (I’d probably eat those daily!!). So many great ideas tho! I have not been to Boston Market in a long time. These lunches look so great! That’s a pretty good deal on the rotisserie chicken. A great way to stretch the lunch budget, for sure! The homemade chicken soup would be my first choice to put it to good use. Love that price for the rotisserie chicken. We love making chicken sandwiches with leftover chicken. I really like these meal ideas. I like that it’s a wide variety of foods.